This super stylish cocktail dress is a statement piece for this season! It showcases a modern approach on vintage glamour and it’s perfect for any special occasion or formal gathering. 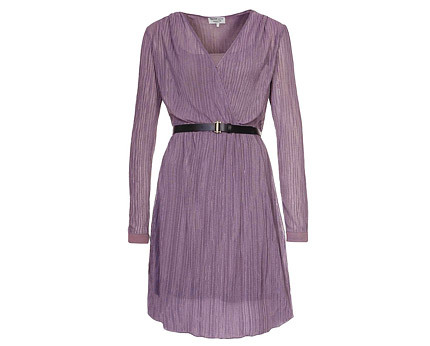 This dress features a soft purple with a black contrasting waist belt. The elegantly pleated skirt and top with long sleeves is truly eye catching and ultra flattering! The chiffon fabric flows beautifully and is perfect for swirling around on the dance floor. The plunge V neck adds a sultry sexiness to this design. Perfect for a dinner date, party or those extra special occasions; you can team this dress with strappy sandals and a clutch to complete an elegant look, otherwise edge it up with shoe boots and a cropped jacket! This item is a wardrobe staple that will never date and because of its elegant knee length cut it is also a great choice for women of all ages!